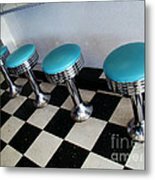 Turquoise Stools by Eva Kato - 8.000" x 6.000"
Turquoise Stools framed print by Eva Kato. Bring your print to life with hundreds of different frame and mat combinations. Our framed prints are assembled, packaged, and shipped by our expert framing staff and delivered "ready to hang" with pre-attached hanging wire, mounting hooks, and nails. 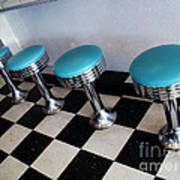 Turquoise vinyl stools on a black and white checkerboard tile floor in a 1950s style retro diner along Route 66.